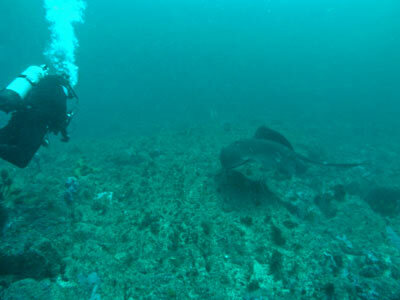 "The SS Tuggerah has massive fishlife"
Michael McFadyen's Scuba Diving - Slipper Reef There are many excellent boat dive sites in the Shellharbour area, however, most divers tend only to dive the shore sites. Located only 105 kilometres south of the centre of Sydney (no more than one and a half hours drive from most spots), this is an area that can easily be visited for one or two dives on the one day and still return home before nightfall. To the immediate east of the Bass Point Reserve there is a small rocky islet called Bass Point Island. There are a number of different dives you can do around this island and many more to the north and south. To the north there are numerous dive sites. These include Hump One, Rons Wall and more. To the west of Rons Wall is another dive site. This is called Slipper Reef. The reef top is at about 12 to 15 metres and very flat. 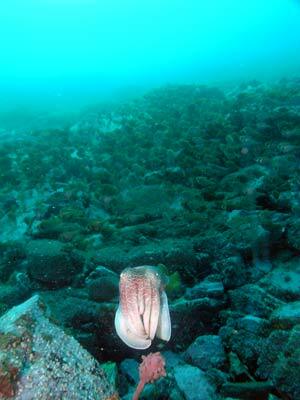 The dive site is located 3.5 kilometres from the boat ramp at Shellharbour Harbour. The GPS Reading is 34° 35' 34.5"S 150° 54' 21.2"E (using AUS66 as datum - see my GPS page for details or you may not find) and there is a mooring there as at February 2007. This is in about 23 metres. The mooring is located on a large boulder, and the rest of the bottom here is rocky boulders. The mooring location is in a sort of bay, with three sides going up to about 12 metres and the other open to the deeper water. The mooring and the area shallower is "white" rock (it is actually pink if you put your torch on it) whereas the deeper area has sponges and other coverings. To the south, east and south-west from the mooring you can only swim for about 20 to 50 metres before you will strike the first of the walls that end up jumping up to the reef top. Once you hit the bottom, look around and you may see one of the rarest fish in New South Wales, the male eastern king wrasse. There will be lots of females about (very plain) and hopefully you will see the much larger and more colourful male. This fish is very friendly, he continually came up to us and permitted (almost asked) us to stroke him. This went on for quite some time till we decided we had to leave and look at other parts of the site. Anyway, head north and you will drop to about 26 metres and can even get to 28 or 29 metres. The flat bottom is composed of a sandy rocky material with lots of kelp. There are some small boulders on this area. Turn right a little and follow the reef edge in a rough northerly direction (it may be a little to north-north-east). Along here there are some larger boulders and around them hundreds of big eyes. You may also see some cuttlefish. The sponges and other fixed marine life here is amazing. There are lots of gorgonias, some are small and others quite large. There are pink, red, yellow, purple and more colours. After 75 metres or so, turn around and come back a bit shallower. Once back near the mooring, head west along the reef edge. 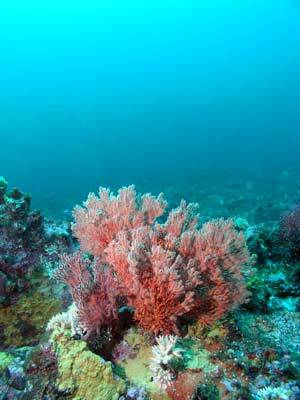 As you go you will see that there are even more sponges and gorgonias. After 75 metres or so the reef turns a little to the north from west and is a bit more vertical. Just past here is a good spot to turn around. Once back at the mooring, spend some time exploring to the east, south and south-west. You will see a small cave south-east and this may be home to a large wobbegong shark. Overall the fishlife here is not too bad, but can be especially good shallow. Huge schools of one-spot pullers, old wife, lots of black reef leatherjackets and six-spined leatherjackets can be seen. 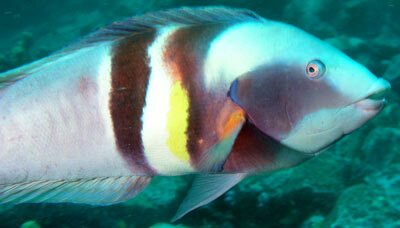 In the shallower area there are some large bream and sometimes, huge schools of large drummer. You can do quite long dives here, starting off deeper and ending up in the shallows. A really great dive site that deserves being visited many times.